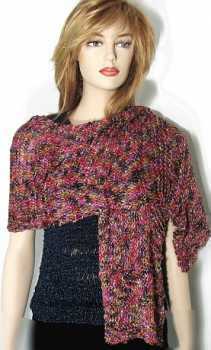 The Kayla Wide Scarf/Shawl may be worn either as a scarf, head wear on cooler days, or as a mini shawl. The scarf/shawl has a nice drape and uses only 3 balls of Magical Treat. The colors available for Magical Treat are rich and beautiful with a generous amount of glitter and glam. Work Pattern Stitch until piece measures approx 60", ending with R1-8.